Being such a grown up, Connor has traveled back and forth to California in the first few months of life. Though I never said much about the trip out to California, just know that it was just short of a nightmare. I was pretty much ready for a meltdown (by me, not the baby...well, the baby was probably ready for another one) by the time I got to my mom. I was covered in spit up, baby poop and feeling tired and gross. Connor was down to no more clean clothes or clean blankets. For the 6 weeks I was stateside, I tried to forget that flight. Then came the time to come home...I wasn't expecting much. But, I was going to try some different things, and bring extra clothing for myself and Connor. I decided to bring Connor's sleep wedge on the plane, along with his pajamas and a blanket to wrap him in for sleeping. I don't know if it was because it was night time, or because of the routine, but Connor went right to sleep when I changed him and laid him down. The only time he cried on the plane was during take off, because of his ears. Even then, as soon as I put a bottle in his mouth, he stopped. 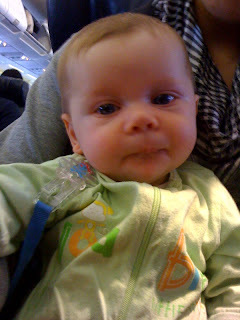 When we got off the plane, so many people were complementing me on what a great baby I had. I thought so too, until that night. Connor has had a hard time adjusting to the time change. And, for his sake, I will admit that it is harder adjusting this way (going ahead in time), then it is going back to the states. On Tuesday night, he was up until almost 6am. And, if we weren't taking care of him, he would let us know with a nasty scream (a few days ago, he found his "loud voice"...fun times!). To keep my neighbor from hating me, I caved in and entertained the little fellow. Last night was better. He went to sleep about midnight. So, hopefully every day will be a little better. If not, in a couple weeks, my neighbor will be gone for 6 weeks and no longer will I care when my child is screaming for no reason, in the middle of the night. Watch out Connor, you don't know what is coming your way!